Japanese police have arrested a man trying to take genetic material that could have been used to breed Japan’s renowned Wagyu cattle to China, causing consternation in an industry that guards its reputation jealously. Police in Osaka searched the home of the man, who has not been named but is understood to be in his 60s, after he attempted to export the fertilised eggs and sperm of Wagyu cattle to China last year. The man took a ferry from Osaka to Shanghai in July with a metal container filled with liquid nitrogen and hundreds of samples of frozen eggs and sperm, the Yomiuri newspaper reported. He was stopped by Chinese customs, however, as he had not obtained a quarantine inspection certificate before leaving Japan. After returning to Osaka, the man applied for appropriate paperwork from Japanese customs officials, prompting an investigation. Authorities subsequently charged the man with violating the Domestic Animal Infectious Diseases Control Law, which carries a maximum penalty of up to three years in prison or a fine of 1 million yen (US$9,000). The man told investigators he did not know it was illegal to take genetic material abroad and he had been asked by “an acquaintance” to deliver the frozen samples to a Chinese who would meet him in Shanghai. An official of the agriculture ministry in Tokyo told the South China Morning Post it was the first time the law had been applied to an attempt to illegally take genetic materials out of the country. “The breeds of cattle that are recognised as Wagyu are unique to Japan and we need to protect our genetic resources and keep them inside Japan,” said the official, who declined to be named. “The worry is that if these materials are used to breed cattle in China, then that country will develop a Wagyu industry and they can sell their products anywhere in the world, bearing the Wagyu name. Demand for Wagyu, known as the “Rolls-Royce of beef”, is surging and Japanese producers have reported a sharp rise in exports, which have helped to lift prices to record highs. Japan’s beef exports surpassed 20 billion yen in 2018, nearly double the 2015 figure, and the government has set an ambitious target of 25 billion yen in exports in 2020 as an important component of the drive to record 1 trillion yen in agriculture, fishery and food exports. One of the biggest export markets for Japanese beef is Hong Kong, where restaurants prefer beef that has a reputation for melting in the mouth. Key to the perfect steak, aficionados say, is the perfect marbling – the intramuscular fat that gives Wagyu its silky texture and high price tag. A small steak in an average teppanyaki restaurant in Japan will typically cost 8,000 yen but prices rise dramatically for anything more than a basic set. Will Hong Kong buy US$102 wagyu beef sandwich, one of world’s priciest? Japanese Wagyu comes from one of four unique domestic breeds: Japanese Black, Japanese Brown, Japanese Shorthorn and Japanese Polled. Calves are registered by breed and about 400,000 Japanese Black – the commonest of the four breeds – are born every year. Cattle are raised for 900 days – fully 10 months longer than most beef cattle. In the 1970s, before Japanese beef farmers realised the potential of their herds, a limited number of Wagyu cattle were sold to Australia and the US, where ranchers have cross-bred them with local cattle to produce a variant, although a ban was introduced on exports in 1991 to protect the domestic industry. 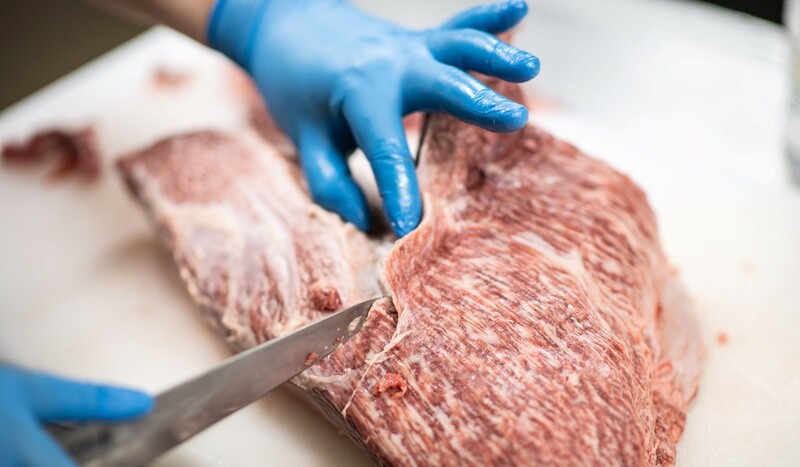 “We have to protect our industry and we cannot afford to export the genetic material that would allow other countries to produce Wagyu,” said Kazuhiro Tanaka, director of the Livestock Division of Kagoshima Prefecture, which has a large Wagyu sector.